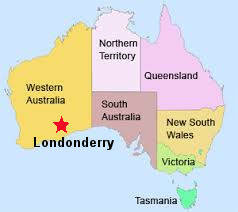 A suite of samples was collected from this area in 1994. Most quartz samples from this pegmatite deposit lack low temperature decrepitation caused by CO2 rich fluid inclusions. This contrasts with some other pegmatites such as Tanco, Canada where CO2 rich fluids were common. There are significant differences in decrepitation within and between the 2 pits sampled, indicating that the fluids were quite variable on a local small scale. 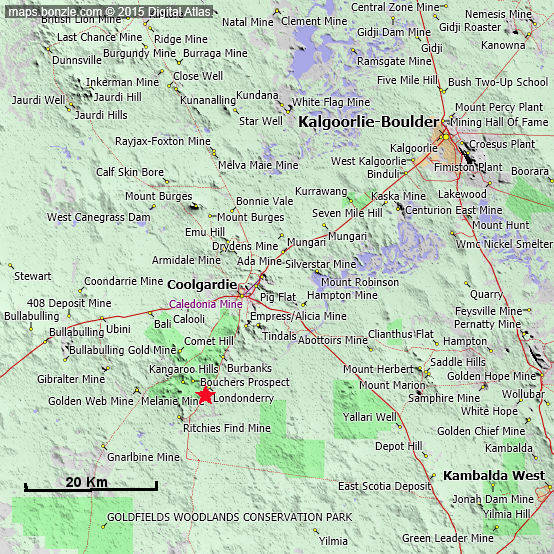 In particular, only one of the 2 areas sampled contained CO2 rich fluid inclusions in the quartz samples. Most feldspar samples do decrepitate but typically at much lower intensity than quartz samples, and a few feldspar samples do not decrepitate. Fluid inclusions are preserved in feldspar samples, and their differing decrepitation patterns indicate deposit scale variations in deposition conditions. But it is difficult to interpret the meaning of these variations. Lepidolite does show weak decrepitation, but this may not be due to fluid inclusions which are probably not preserved in the platy and weak crystal structure of this mineral. 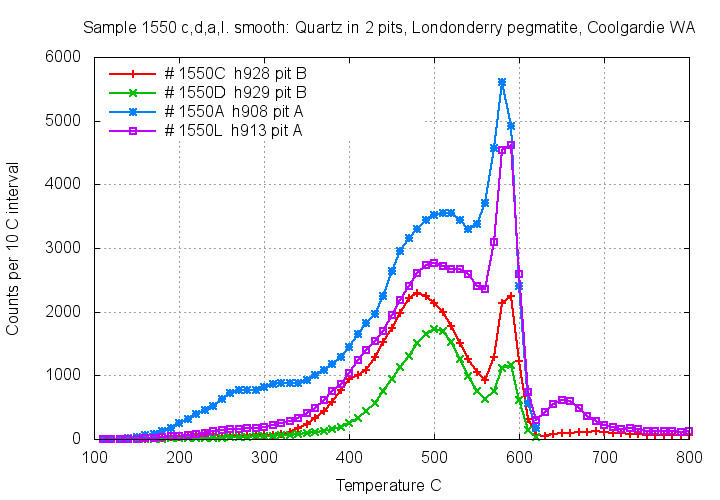 Quartz samples 1550A and 1550L show low temperature decrepitation near 250 C indicating the presence of CO2 rich fluid inclusions. Samples 1550A (quartz, red) and 1550B (feldspar, green) are adjacent and should show the same fluid inclusion characteristics, but the feldspar has no decrepitation and seems to contain no (or only very small) fluid inclusions. 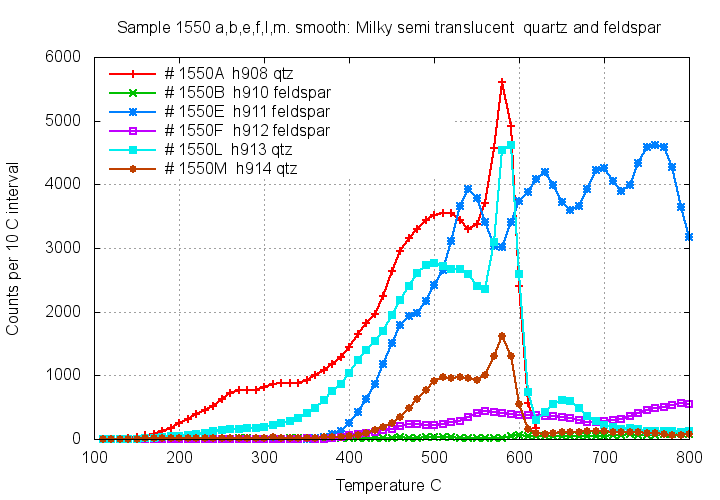 But other feldspar samples, notably 1550E (blue) do decrepitate and contain abundant fluid inclusions. 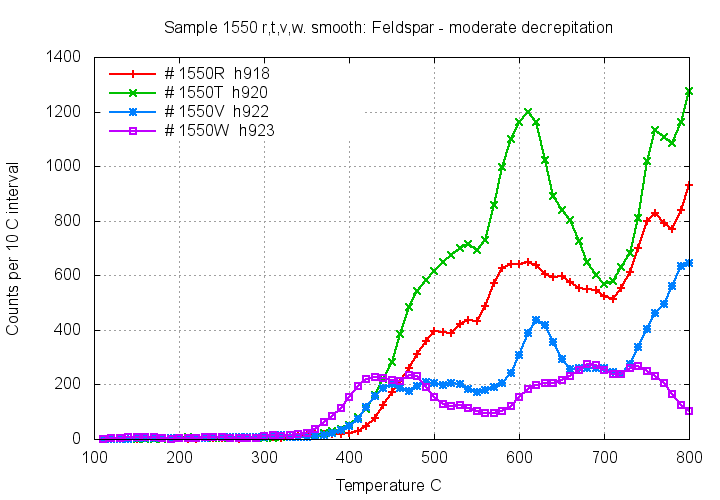 Many feldspar samples have only low levels of decrepitation, and the decrepitation graphs show irregular patterns. 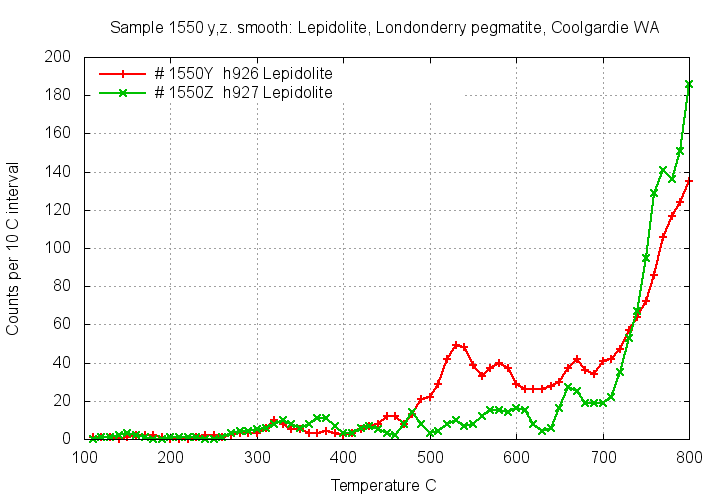 Samples of lepidolite show only very weak decrepitation. The platy crystal structure of lepidolite is unlikely to preserve fluid inclusions and this decrepitation is probably not caused by fluid inclusions. 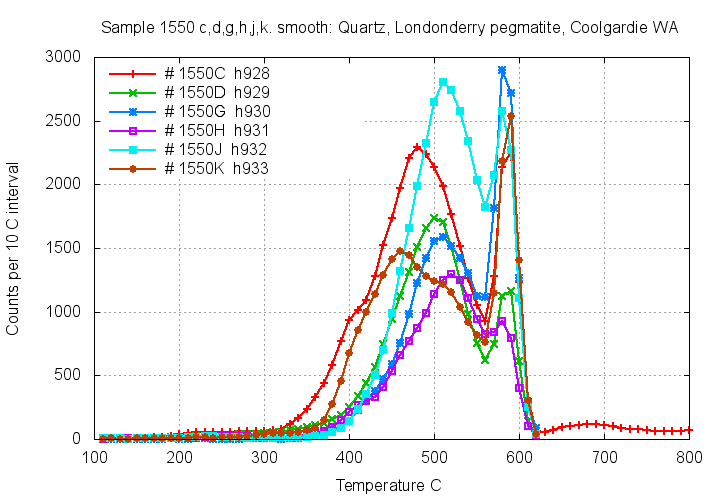 Quartz samples show significant variation in decrepitation patterns across the deposit, probably indicating var2iations in the formation temperature on a local scale. 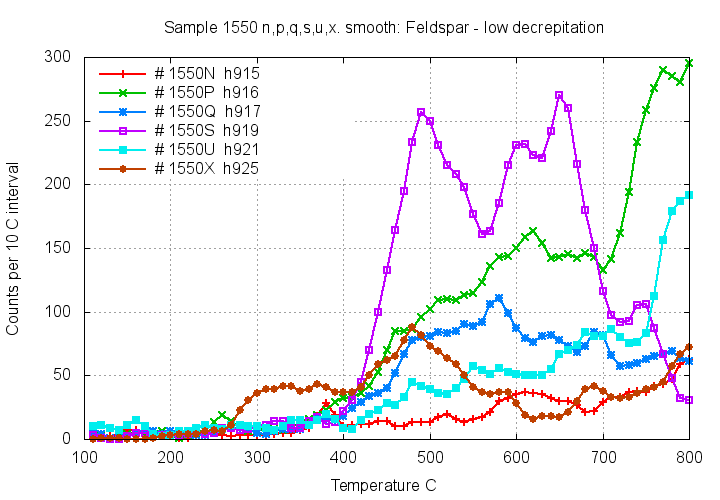 But none of these samples contains CO2 rich fluid inclusions. Quartz samples from 2 separate pits some distance apart are similar, but only the 2 samples from pit A contain CO2 rich fluids, which seem to be of restricted spatial occurrence.